AR Modular RF, a world class manufacturer and solution provider of RF amplifiers, systems and modules, has been awarded a repeat order into the most prestigious National Accelerator Laboratories. The AR Modular RF model KAW2100 sets the pace as the proven low-level RF driver amplifier at one of the nation's top Accelerator Laboratories. 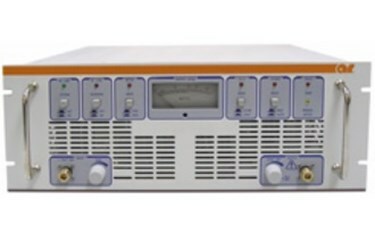 With the increasing demand for high repeatability and low distortion amplification of critical waveforms, the KAW2100 continues to provide highly reliable and most importantly repeatable performance, delivering in excess of 200 Watts CW. The KAW2100's repeatable RF amplifier performance has been maintained even after a great many years of production and therefore continues to be one of the core building blocks in this successful particle accelerator system. The unit is designed into a very sturdy 19 inch rack assembly complete with AC power supply, extensive heat sinking for the power amplifier module and air fans to keep the unit running cool during very long testing periods. AR Competitive Edge products supply a multitude of unique RF solutions to companies around the world. The company's limitless support network reaches the far corners of the globe. AR products are backed by the company's "Competitive Edge" warranty, the best and most comprehensive warranty in the industry. When companies purchase from any AR company they have the peace of mind that comes from knowing the global leader will be there to help with any problems today, tomorrow and always. For more information, visit www.arworld.us.